Welcome to Stratford Antique Center's online information page. 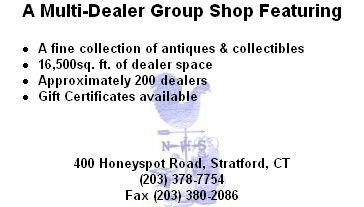 STRATFORD ANTIQUE CENTER is a multi-dealer shop conveniently located off I95 in Stratford Connecticut. Locally known as the Big Blue Building, the center houses 16,500 square feet of antiques and collectibles offered for sale from approximately 200 dealers. Whatever you are looking for in antiques or collectibles you can probably find it here. The center features numerous dealer floor spaces and lighted display cases. Many articles have been written about the Stratford Antique Center in it's 20 year history. Read News articles from the Antique Trader Weekly and The Connecticut Post. Click on the rooster below to read articles.